• Helps swimmers with neck and back issues navigate the water. • 1-way purge valve allows for quick water release. 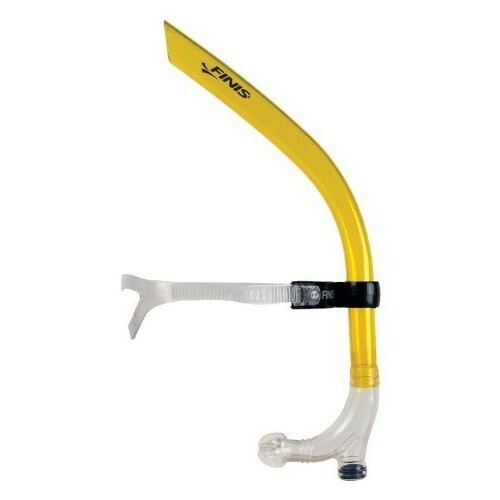 • Snorkel head strap is easily adjustable and fits all sizes. • Elliptical shape minimizes drag. • V02 Max: Increases aerobic capacity. • Center-Mount Design: Relax in the water in order to focus on stroke and improve technique. • One-Way Purge Valve: Allows for clear and easy breathing. • Hydrodynamic Design: Worn with swim goggles promotes proper head and body position. • Front Positioning: Swim at slower speeds with perfect stability. • Adjustable Head Bracket: Can be worn in conjunction with swim cap or goggles. • Stays in place for all competitive strokes, including flip turns. • Silicone Mouth Piece: Soft, comfortable and flexible medical grade silicone. • Injection-molded Thermoplastic and medical grade Silicone. • Dimensions: 1''W x 21''L.